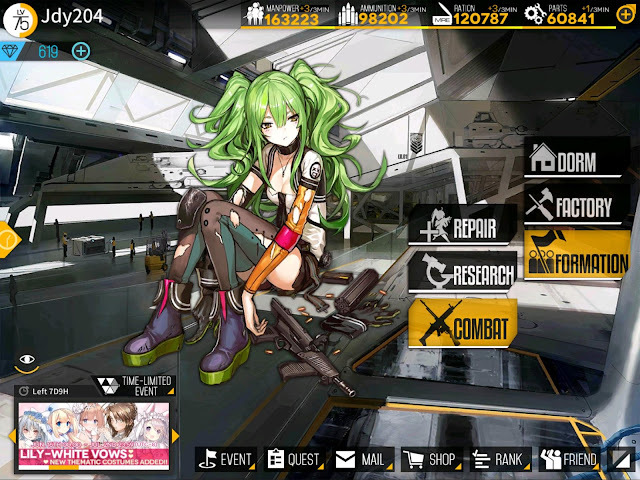 Welcome to First night level missions in Girls Frontline! I’ll be looking to try my best to guide commanders through these missions with hopes to help unlocking equipment enhancement and later in Area 2, equipment calibration. 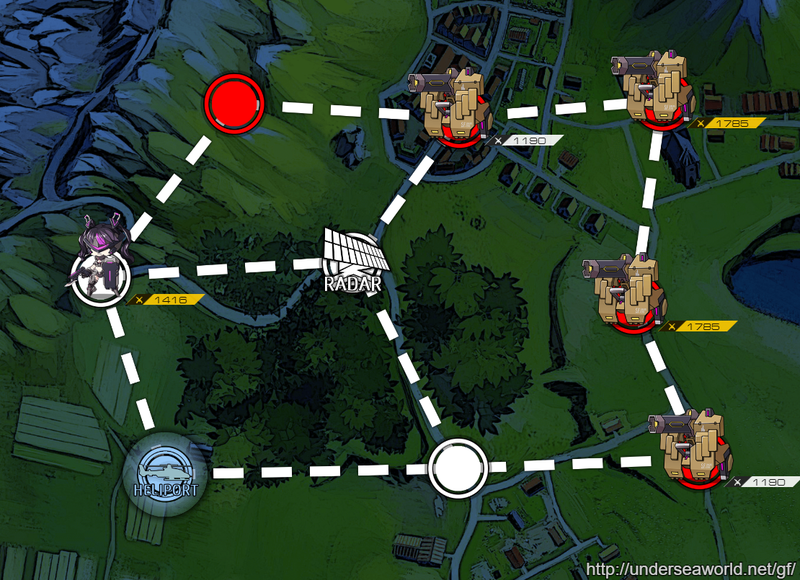 Before I dive into walkthrough, I’m going to explain my set up here with some details and why I have done such. All the squads I have currently are well equipped and well trained in skills, so don’t think that you also need same Combat Power [CP] or set up to beat these night missions. However in order to beat night missions, I do recommend having beat and cleared normal and emergency missions so that you can breeze through these missions. So let’s get to echelon set ups. This is the Ar squad designed to tackle the normal units in night missions. I just realized that in the photo G41 and M4A1 should have PEQ as scope to increase accuracy. But I left FAL as is so that her AoE skill still does lot of damage. 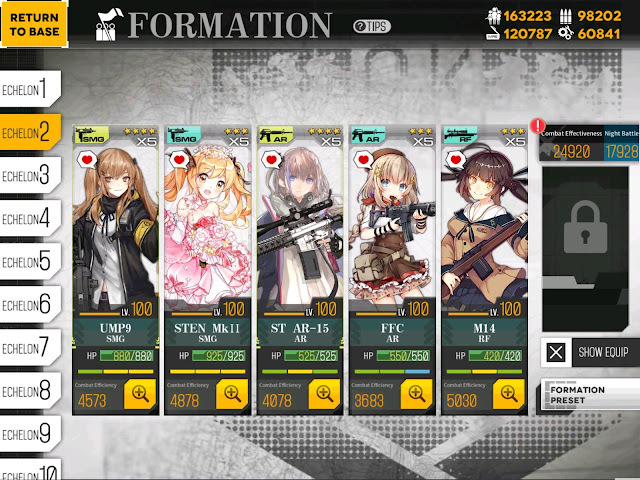 With this set up I focused on having 2 AoE skill that ignores armor if it runs into the armor units and M4A1 and G41 to still deal dmg to armor units with self buff skills. 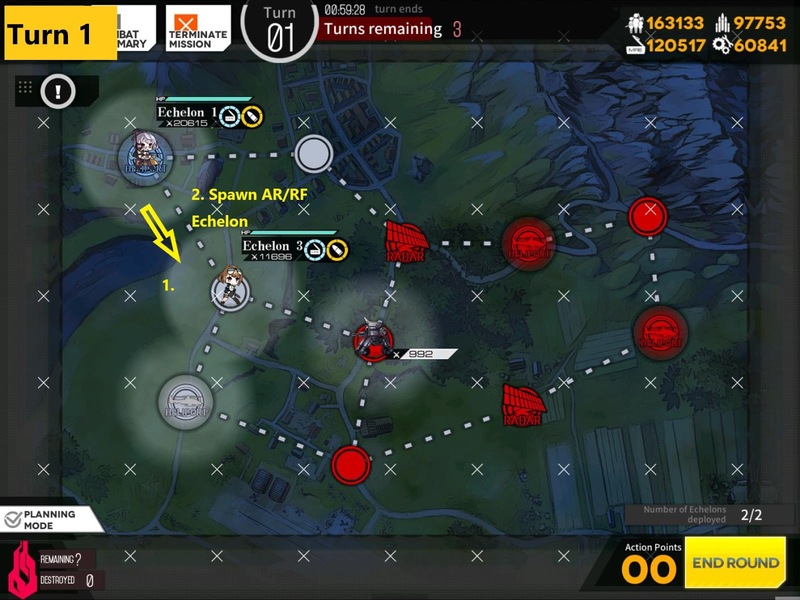 This is not too far off from lot of new player’s first echelon set up, so if you have high level and decent links/gears, this unit is well situated to tackle any type of enemy units in night mission. If you are beginners tackling the night mission, I would recommend removing off tank with HG to have increased vision range. 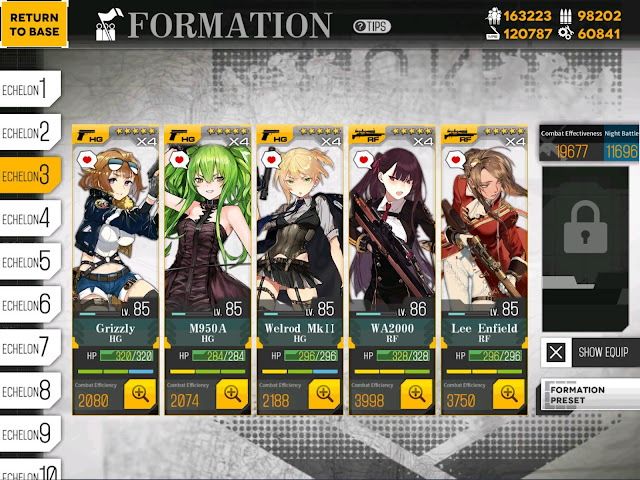 This is AR/RF squad mix squad that again can be similar to first echelon set up with one RF replacing an AR or HG. This again is well situated to tackle any unit type, with added bonus of RF being excellent at tacking down armored units with AP round. I have selected FFC since it has self dmg buff skill which can help against armor units and Star being able to equipped two dmg buff items even after PEQ. Again, if you do not feel comfortable running blind without HG, substitute off tank for HG. 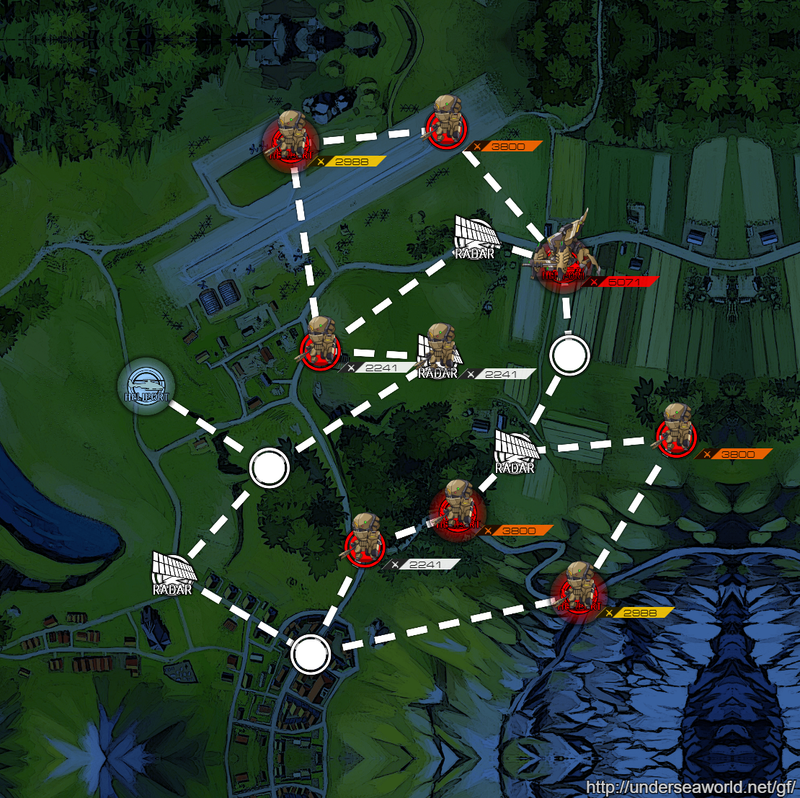 The meat and bone of the night mission, and easiest way to kill Manticore unit in each X-4N. This squad does need HGs to be well linked and leveled in order to survive and protect RF while it takes care of Nemeum (Cannon) units in the back that does tons of dmg if hit. in Early missions, 3x links should be fine but in Area 3 night mission, I would recommend least level 70x with 4x links for this set up or even to 80 so Exos can be worn to increase evaison. If you don’t feel comfortable with your HG links and level, I recommend set up of 2 SMG / 1 HG / 2 RF. This increases the endurance of front line while still being able to dish out dmg to enemy back line. I deal set up would be in a formation with 2 SMG in the front, 1 HG and 2 RF in the back. Update: 11/06/2018I have noticed that lot of people are using my set up above, which makes me happy but know that it is not a ‘meta’ team composition [either you set up with rof buff rfs together or fp buff rfs together]. If you have better rfs, use them instead of this composition! 3 Echelons should be plenty with now help of Friends Echelon in order to clear current missions. One thing to keep in mind is that in Night missions, enemy movements are completely random. So be flexible with your movement. I can only give a general guide that will work most of the time, but minor adjustments will come from you, commander. 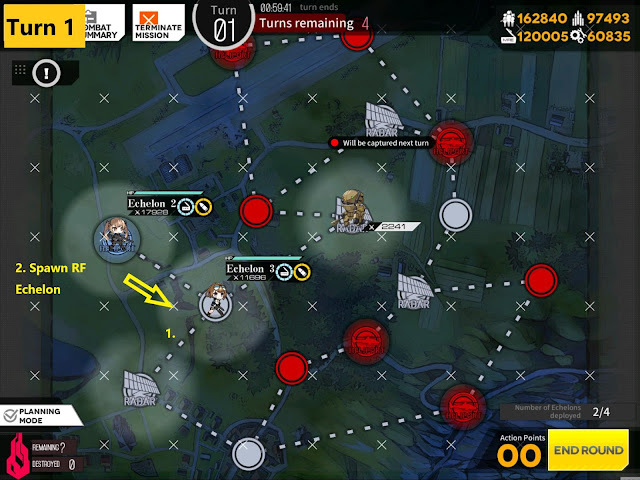 One important thing that will sound obvious but crucial if you are following my setup: If you don’t have HG in your squad and want to call in 2nd/Friend Echelon, you can’t because you don’t have vision of helipad. 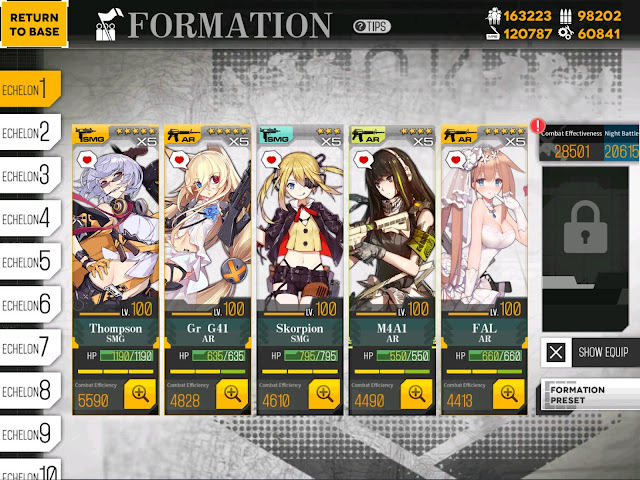 Which makes HG mandatory on first Echelon deployed on the mission. Keep this in mind! When you end turn, you will see Friend Echelon move to right, despite having no enemy unit in sight. 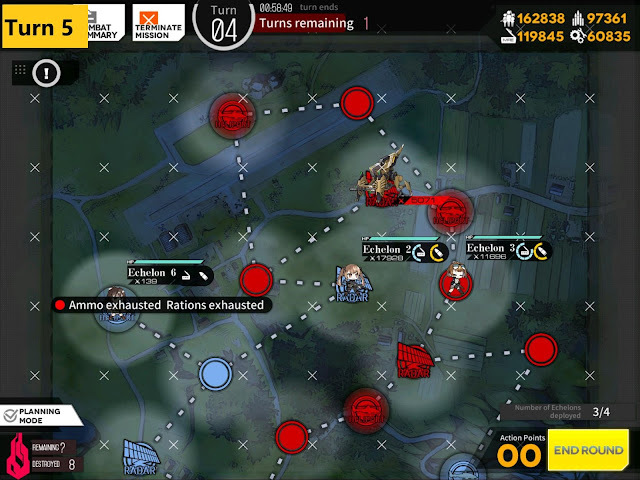 Then enemy unit on its right will run into it. 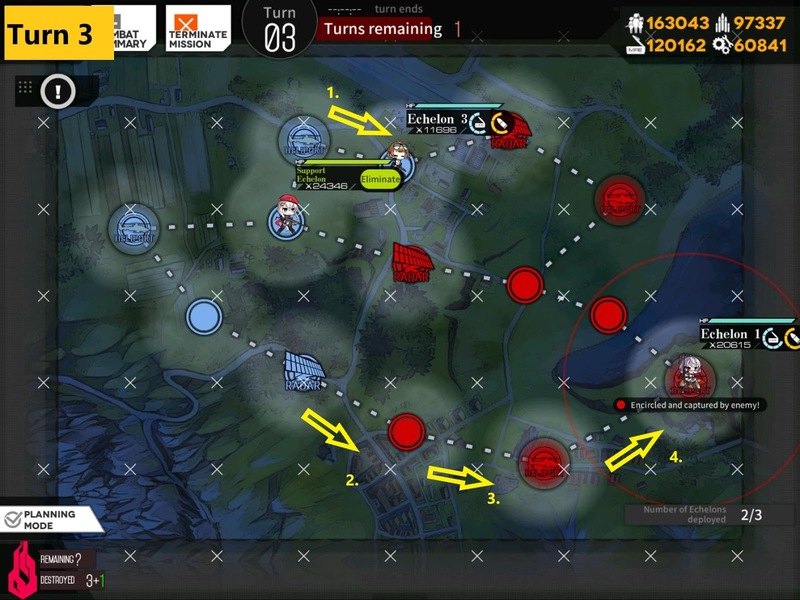 Depending on how enemy units moved last turn, pick the route that makes most sense. Goal is to kill all units by end of turn 3. 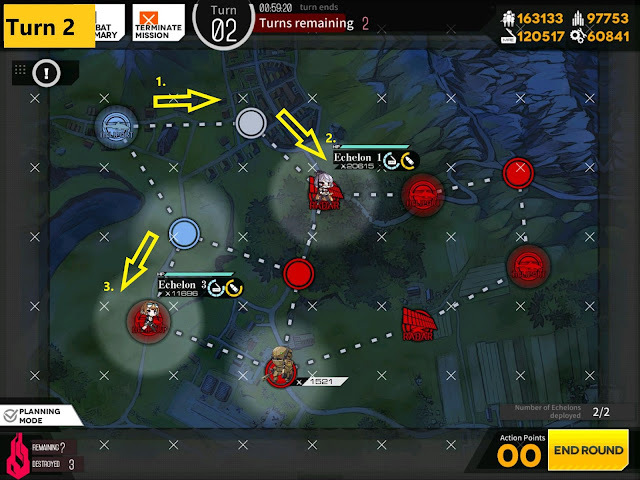 Either by end of enemies turn you will have killed all units, or have one more turn to kill the remaining unit. There is some chance that AR/RF squad is going to fight the armor units, so be prepared. This turn is where you move according to enemy movement to kill all of them. 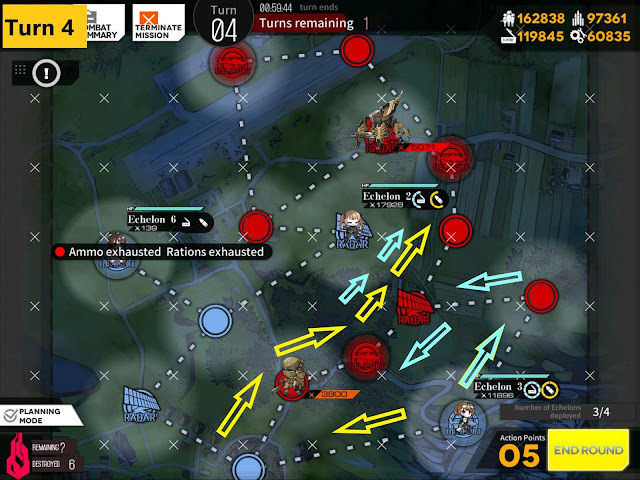 There is still extra turn after this one, and with 3 remaining tiles to cover, it’s easy victory. Required Squads: 2 [RF & AR or AR & AR] + 1 Friend Echelon. 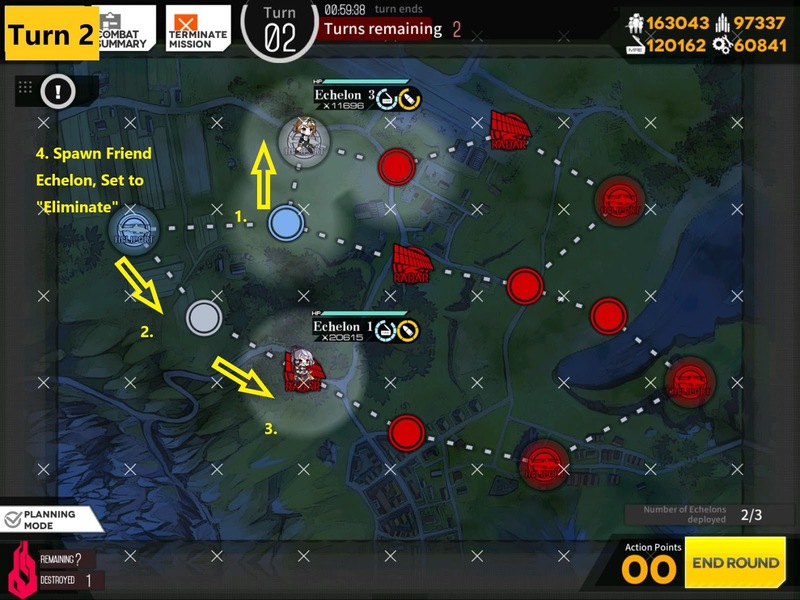 On the last turn you will have visibility of all tiles thanks to Friend echelon taking the mid Radar node. 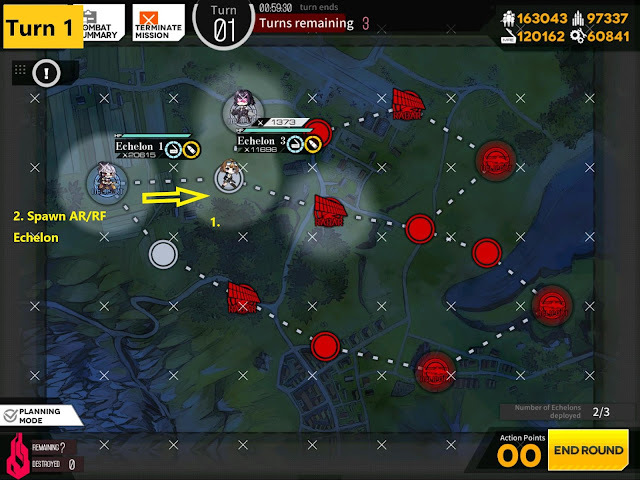 Use either RF or AR squad to take the rest of the enemy units. 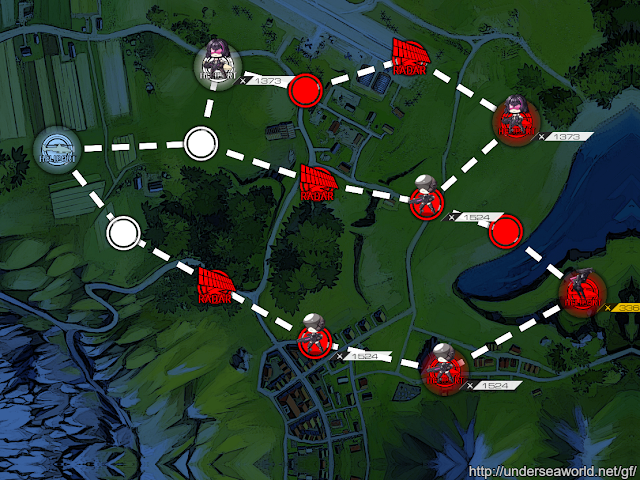 There is a unit of Scout that has high evasion and will be painful for RF squad… Hope you brought a AoE skill. Required Squads: 2 RF + 1 Dummy Echelon. It gets bit complicated in this level, so be prepared to be flexible with movements and always making sure you have HG on your echelon unless you are confident with your ability to kill armor units with all echelons. 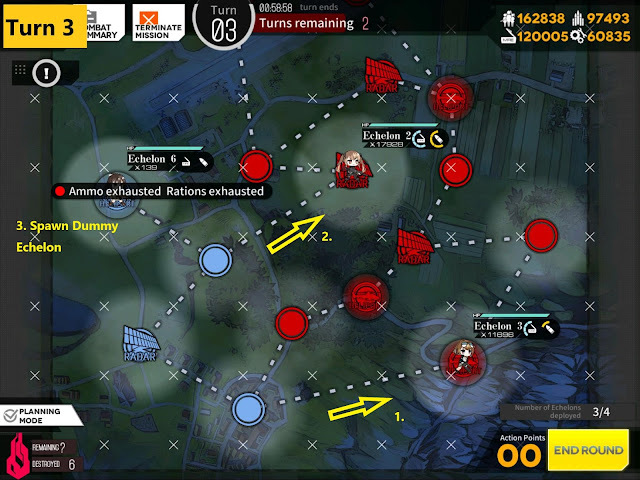 This method has chance of backfiring if your 2nd RF echelon cannot take on Manticore unit. 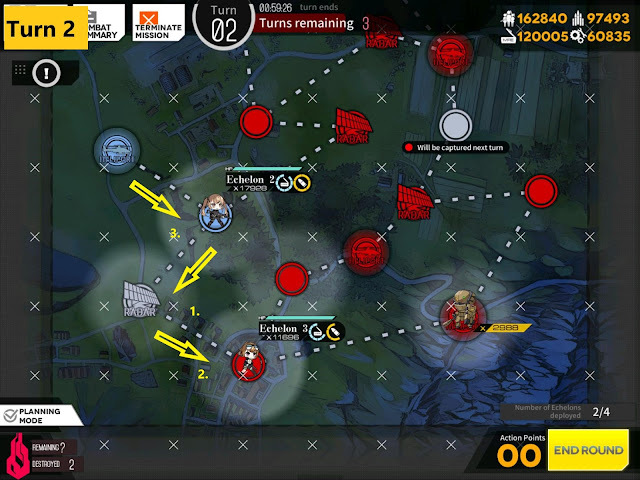 We are surround taking the Radar on bottom Left. This also illuminates starting Helipad next turn. This is where things could get hairy. 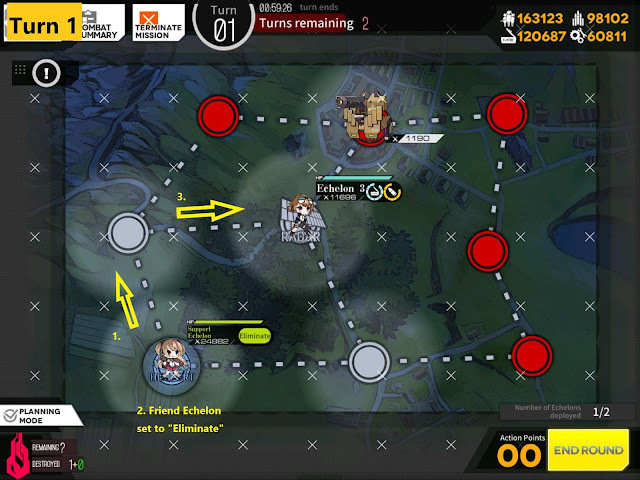 Since movement in random, Manticore could be right next to Echelon 2’s location. For me, I got lucky and it moved away instead of running into it. 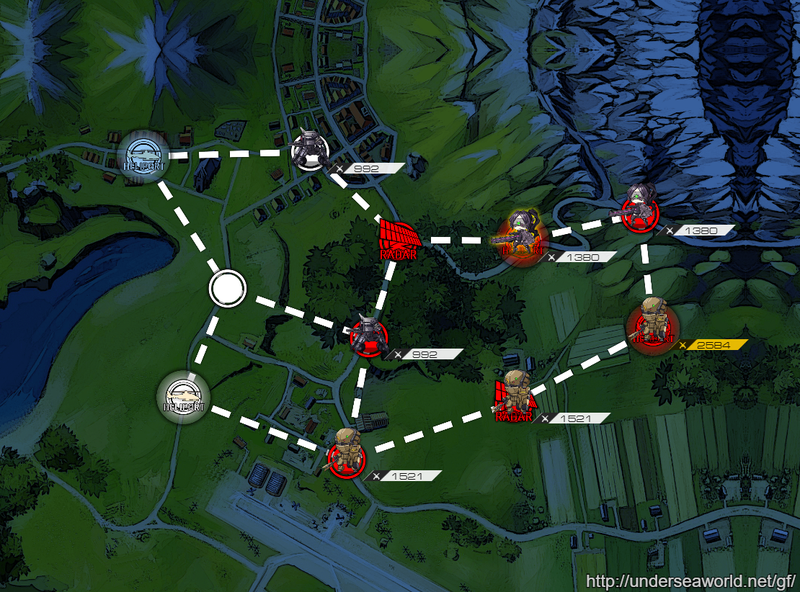 Turn 4 is to clear the bottom tiles depending on where you see the enemy unit coming out of visible area. If you see armor unit popping up top, take light blue route. If you see like picture above, take yellow route. 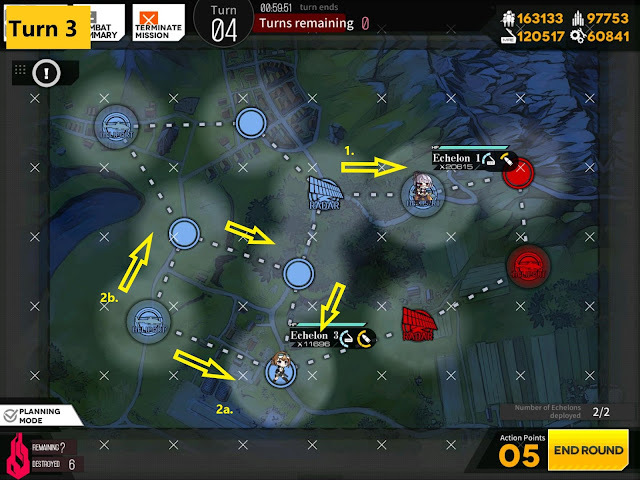 Both route ends at a same spot. Make sure to resupply before you move however. Turn 5 starts with only 5 tiles left with potential enemy units on it. 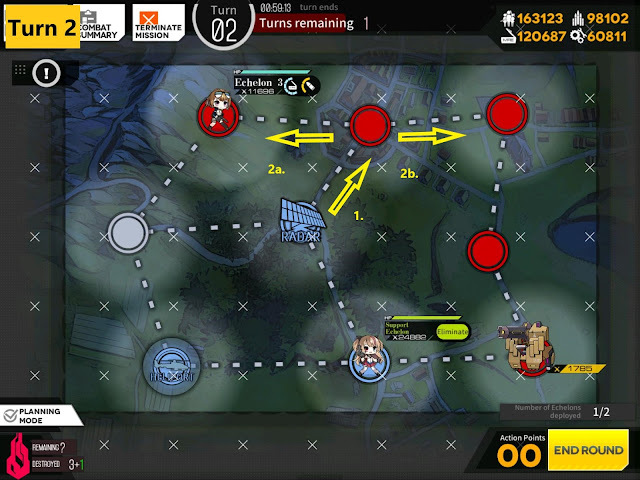 You have 5 Move points. Easy victory.